Saypha Filler with Lidocaine is an injectable gel used for correcting moderate to severe wrinkles, including forehead furrows, glabellar lines, and perioral wrinkles, or for adding volume and contour to the lips. Its monophasic hyaluronic acid binds to water molecules within the skin, adding volume and hydration for a smoother skin texture. This dermal filler is suitable for use on patients with visible signs of aging. Saypha Filler is a resorbable filler used to diminish the visible signs of aging, including moderate to severe wrinkles. It may also be used to add volume to the lips. Made of pure, medical-grade hyaluronic acid of non-animal origin, this product is generally well-tolerated, and results are natural and convincing. Made by Croma, a company specializing in the production of hyaluronic acid syringes, products from the Saypha line are made with a unique automated manufacturing process that assures its safety in use. This product contains also lidocaine for the comfort of the patient. This product is an implantable gel that is primarily composed of hyaluronic acid. When injected into the dermal layer of the face, this gel plumps the skin, restoring volume and smoothing the complexion. In addition, the hyaluronic acid acts as a humectant in the skin, replenishing moisture levels. This restores radiance and suppleness to the skin, lifting the face and giving it a youthful appearance. Treatment with Saypha Filler with Lidocaine consists of injections of the product into the mid to deep dermis layer of non-inflamed, disinfected, and healthy skin. Treatment should only be carried out by a trained, licensed medical practitioner who is skilled in performing cosmetic injections. Inject the product slowly into the area to be treated using the appropriate injection techniques. Please refer to the packaging insert for the complete set of instructions for use. This product may be used to treat the visible signs of aging, including volume loss and the formation of wrinkles. It may also be used for the enhancement of the lips. 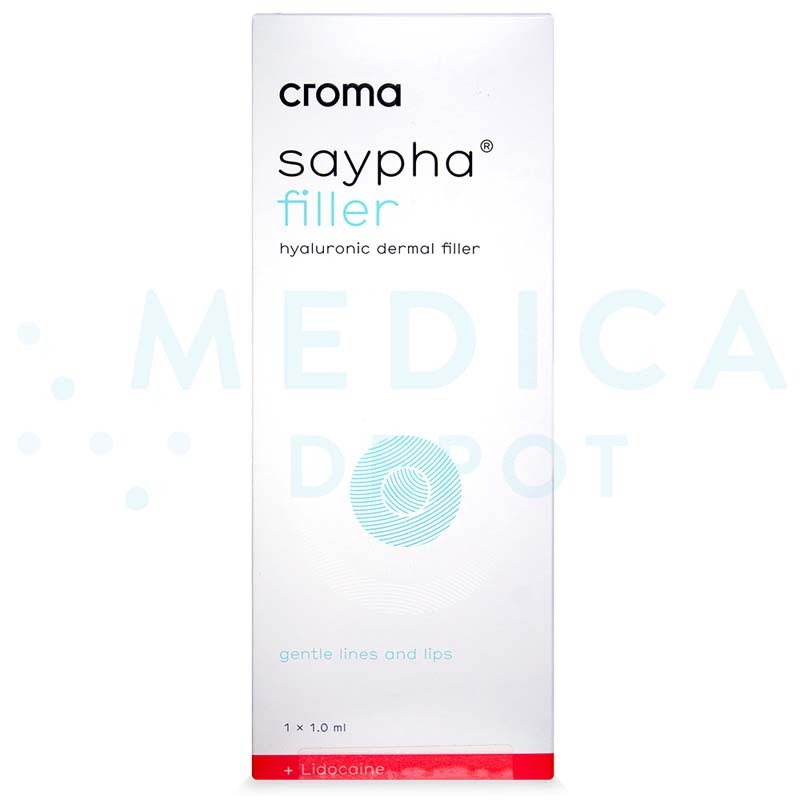 Saypha Filler with Lidocaine can be used to treat facial wrinkles such as forehead furrows, the temple region, the cheeks, perioral wrinkles, marionette lines, the nasolabial folds, the lips, and the chin. However, this product is not recommended for use in the delicate periorbital area (e.g. to treat crow’s feet, under eye circles, or the eyelids). Results typically last for a period of 6 to 10 months. After this time, the hyaluronic acid in the filler breaks down and is naturally absorbed by the body. Suitable candidates are men and women who are exhibiting signs of aging such as wrinkles and volume loss, or who are looking to enhance their lips. Candidates who are not suitable are those who tend to develop hypertrophic scarring, who have a history of autoimmune disease or who are receiving immune therapy, who are hypersensitive to hyaluronic acid or lidocaine, who are pregnant or breastfeeding, or who are below 18 years of age. Saypha Filler with Lidocaine is a beneficial cosmetic treatment, with natural, durable results and very minimal side effects. As a medium viscosity gel, this product is suitable to correct a wide range of age-related concerns, from wrinkling to facial volume loss. Manufactured according to the highest safety standards, Saypha Filler generates a high level of patient satisfaction, with 98% of patients reported to be satisfied with their treatment. With a long track record of safety and efficacy, you can rest assured that Saypha Filler will give you the results you desire for your patient. While adverse effects are rare with the use of this filler, some injected-related reactions may occur. These include erythema, itchiness, pain, bruising and swelling at the site of injection. These reactions are typically benign and resolve spontaneously within a week. Should they persist, your patient should seek medical attention.